The Chicago Bears have been on my mind of late, for two reasons. The first, of course, is that they're one win away from the Super Bowl, and they'll have to get that win over their arch-rival the Green Bay Packers. (Bears-Packers rivalry) They've been playing each other since 1921 in 183 regular and post-season games, but they haven't met in the playoffs since 1941. It'll be epic. 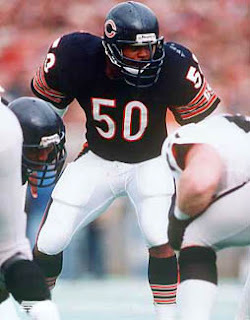 The Bears were good for a lot of years in the 80s, mostly because of their defense. They won 7 division titles and went to the play-offs 8 years in a row. In 1985, there defense gave up just 10 points in the entire post-season, and all of those came in the Super Bowl (and 7 of them came in the 4th quarter when the game was well put away). They shut out their two play-off opponents, the only team to do that. Towards the end of his broadcasting career, I was listening to game being covered by Pat Summerall. He had played in the NFL as a placekicker in the 50s and then did play-by-play for games starting in the 1960s until just a few years ago. During this game I was watching, the commentators started talking about great defenses, and the 1985 Bears came up. Summerall said, with genuine fear in his voice that could only come from a former offensive player "That defense was terrifying."